The new website is more animated, eye catching and dynamic. Full details of our ‘one stop solution’ including the Sharp-aX software, related services, instant software Support and our fully integrated Websites. We will not stop here – please let us have your feedback – how can we further improve our website for you? Just call 01442 505950 or email to web@sharp-ax.com – We will be delighted to hear from you. "The installation has gone very well, and it has saved us a lot of time and made us more efficient especially on the sales desk. We plan to grow the system over the next few years as the company grows"
"I have worked closely with the Sharp-Ax Web Development Team for more than 4 years now. When we first started working together, I was incredibly green and had little knowledge of how to go about creating a website. Sharp-Ax were incredibly patient and helped me through the early stages, quickly earning my trust and respect. Throughout the process they have come up with some truly innovative solutions to tasks I have set and have worked with me to achieve a platform that I am very happy with. I would wholeheartedly recommend them to anyone that is looking to either start a website from scratch or are looking to move their business. It sounds corny Jean, Manish and the rest of the team do actually prioritise the customer experience, which in this day and age is refreshing"
"I've been working closely with the web team at Sharp Ax now for over two years, and during that time they have always been thoroughly professional, reliable and most importantly, very good at what they do. Our site has gone through strength to strength since we went live around 18 months ago, and it has now become a vital part of our business. We regularly receive glowing compliments about the layout and usability of our website from customers and suppliers, and while I would love to be able to take the credit for it, this is largely down to the website template and CMS, which is simple and easy to use. As with all tech installations you may get the odd hiccup or something may not integrate seamlessly with your own system at first, but the best thing about Sharp Ax is that any problem is fixed quickly and with the minimum of fuss. It is clear that they prioritise customer satisfaction, which is refreshing to see from a tech company. I would not hesitate to recommend this company to anyone and I look forward to continuing a strong working relationship moving forward"
"We had a big increase in our daily workload as we set up the new system. Our software problems proved to be minimal though and Sharp-aX came to our aid whenever required, so we were able to move forward with total confidence"
"We wanted to set the company up for the next 15 years with a totally modern Microsoft windows system that has everything we need and all the features that we will need as we grow, and is easy to use. Already it is like having another member of staff and we have all the daily knowledge we need at our fingertips. The sales order processing is splendid"
"I've looked at different systems and picked Sharp-Ax from Sharp-aX Computer Systems, because it used all modern windows techniques and was by far the best I saw; they are very experienced in electrical wholesalers systems and while they are a large software house which is reassuring, you are still treated as important, whatever size you are"
Our primary product is a powerful ERP system featuring integrated accounting stock control software & website systems for trading companies. At Sharp-aX – We prioritise customer satisfaction & happiness! 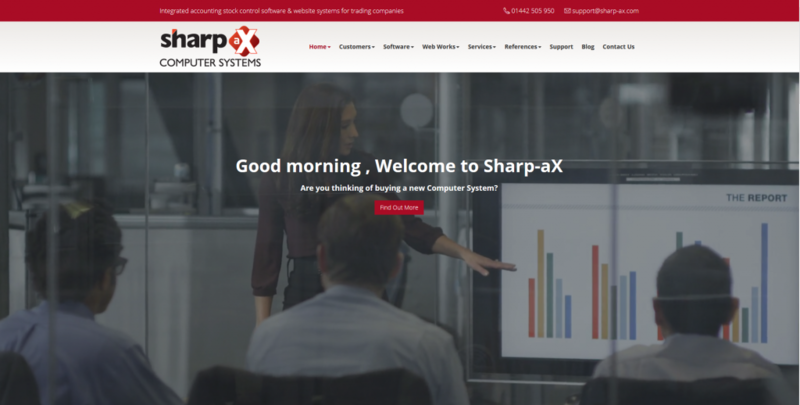 Sharp-aX has it’s own highly experienced in house team of web developers providing fully integrated websites across the UK to the Distribution industry.